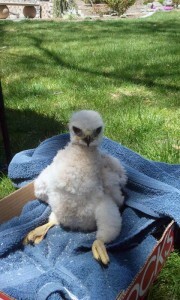 “Little Bit” is a Red-tailed Hawk, born in the Spring of 2012. First-time raptor parents often make inadequate nests, which is probably the case with Little Bit’s parents, as she fell about 120’ from her nest when only a few days old. Normally, we put fallen babies right back into their nest, but in her long fall, she fractured her radius, ulna and foot. Despite the best veterinary care around, her wing fractures healed crooked, and she can not fly. Spending so much time with her human caregivers at an early age has made her quite docile around people and she is a wonderful addition to our Animal Ambassadors!